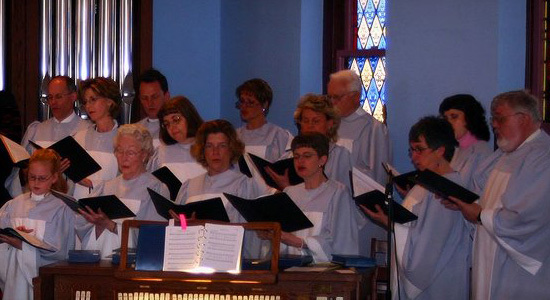 First Presbyterian has been blessed by a rich tradition of a talented Chancel Choir who sings a variety of styles of music each Sunday for Traditional Worship at 11:00 am. Practice is held weekly on Wednesdays at 7:30 pm, with a break in the summer time. The choir is led by our church musician, Chris Jones, who is a very talented pianist and the director of our local community arts center, The Prizery. New members are always welcome to join us at any time! An integral part of each week’s Contemporary Worship Service is the Praise Team. This talented group of singers and instrumentalists leads the music during worship, which is approximately half of the service. At present, the group include 7 members who provide vocals accompanied by guitar and keyboard. The group practices each week in preparation for Sunday’s service. The music they choose to enhance each worship service includes praise & worship music, contemporary hymns, and classic songs with a more modern twist. This group is open to new members. We would especially love to have a bass guitarist and drummer/percussionist. 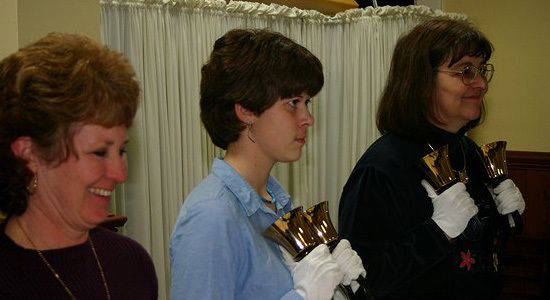 The McKinney Memorial Handbell Choir was formed in 1995 with the purchase of 3 octaves of Schulmerich handbells. In 2004, we added 3 octaves of Malmark handchimes to enhance our music. Over the years, the group has progressed from very simple music to more complex pieces with varying techniques. The group plays for worship about 5 times a year. They have also performed in the community for special events and even played a wedding processional for a choir members’ daughter. This group of 11 women practices each Wednesday at 6:30 pm. They are led by director, Jacquelyn McAbee. The group is open to new members, as they can always use an extra hand. No prior experience or musical background is required.